Besides fighting for the top job in America, Mitt Romney and Barack Obama have been in a bit of an app-off this election season. Romney has released two apps: an Instagram-esque photo app that embellishes pictures with a pro-Mitt overlay, and a veep announcement app that was sadly scooped by traditional media. For his part, Obama put out a swiss-army knife of an app that allows you to canvass, register voters and find local Obama events. 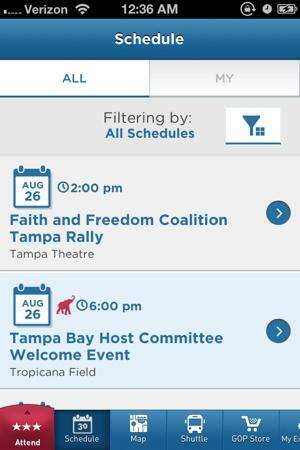 Naturally, there are apps for the Republican National Convention, which starts Monday in Tampa, FL, too. Below a review of four of them. We tested them out on an iPhone, but all apps are also available for Android. And all four apps are free. Unfortunately, much of the Tampa Bay Tribune app's excellent local content is buried under a cumbersome and slow loading navigation. However, buried in the News section is a genuinely useful "RNC Q&A" that features a wealth of information, including details on which weather conditions related to Tropical Storm Isaac could trigger an evacuation of downtown and where to find parking around the convention center. 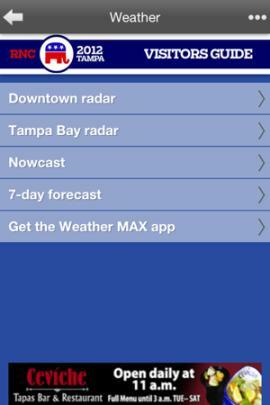 This app also offers a truly killer weather tab, that takes you to a plethora of storm-tracking options: a downtown and Tampa bay radar, as well as a "nowcast." We will be refreshing often. Functions with out cell service? The News and Q&A feeds will display; anything map or radar based will not. This app features by far the cleanest navigation of these four apps--you can toggle between Tampa (red background) and Charlotte (blue, for the Democratic National Convention) and then sort through news, schedule, city information and photos. The news feed is all National Journal content and the schedule features non-official events. The city info button is a goldmine. National Journal has teamed up with indie-goes-limo car service Uber to provide service at both conventions. You'll find a short cut to the Uber app experience built into Re:Con. Be warned: thanks to local regulations, the minimum charge for an Uber in Tampa is a prohibitive $50. Dining recommendations are provided by Zagat, and sorted into meal types--from Leisurely Lunches to Deal-Closing Dinners. Journalists and delegate groupies may appreciate the alphabetical-by-state listing of delegate hotels (though we would have appreciated the ability to sort by location). And National Journal has thoughtfully provided the phone numbers for key figures in the Tampa Host Committee and the Republican National Convention Committee. Attention Tony Feather (director of whip operations): your voicemail is about to fill up quickly. 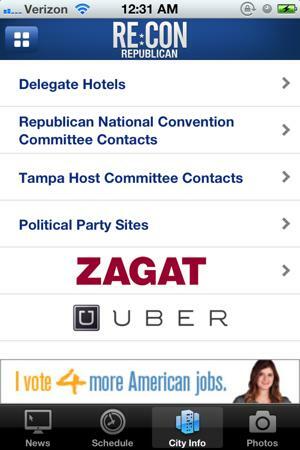 Get it for: the Uber app if you aren't already a user, the delegate hotel list, various Tampa Host Committee members' phone numbers. Functions without service? Nope. The app will close if you are without cell service. The initial navigation is a tad confusing--there are tabs going up (attending/not attending) which then determine your left-to-right tab options, offering everything from info on shuttles to a chance to upload photos to "share (ing) your experience." The app offers good official transportation details--the daily hotel-to-convention shuttle, phone numbers for local taxi services, and information on the Tampa Bay shuttle, which will take you around the city. There's also a GOP swag store for those who want to avoid lines at the convention center--but sadly, it does not offer onesies for the conservative-leaning infants in your life. This app is your place to find the official convention schedule--you can view both outside events and the official plan. However, given the justified fear of spotty cell service, it's frustrating that the schedule is not available offline. The gem: under the "Explore Tampa Bay" tab is a games section that will load a browser-based set of games including Emoji Puzzler, where you are prompted to guess the title of TV shows, movies and songs depicted in emoji. We're ashamed to confess we were stumped by the emoji version of 9-to-5. Functions without service? The shuttle information is accessible, most everything else is not. When you sign into this app you're asked to declare your home state; then you are granted a badge. 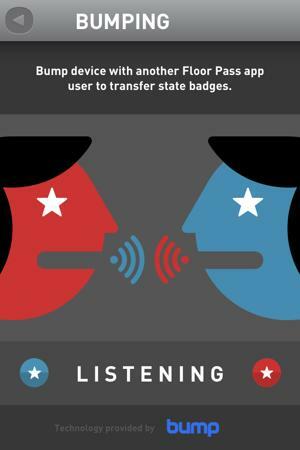 CNN/Time partnered with Bump (an app that allows you to exchange info and photos by touching phones) and if you find others who also have Floor Pass installed you can "bump" to exchange badges. Genius. Under "speeches" you'll find the VP and candidate speeches from both '08 conventions--it appears this section of the app will update with speeches each night. There's also a pleasing, albeit basic, Twitter filtering function that allows you to view tweets employing the official convention hashtag. Pro-Twitter users will likely find it superfluous, but for those eavesdropping on the service it's a nice shortcut. There is a short list of downtown cafes, pharmacies and restaurants, which is available offline. The "top five" section takes you to a vertiginous auto-scrolling newsprint-style layout of recent stories. We were baffled by the option to view Time's "Cover of the Day"--is the magazine going daily over the next two weeks? As with National Journal, the news feed is all Time/CNN content. Functions without service? Local information does, speeches do not.